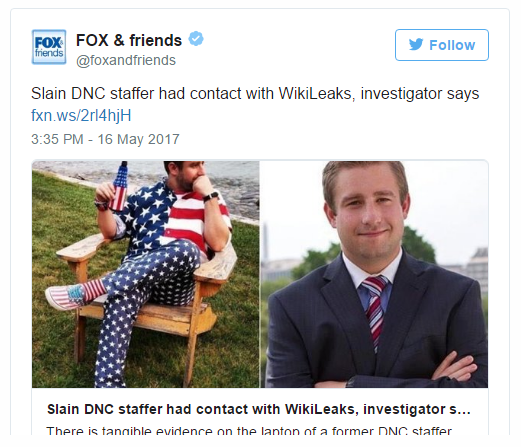 Cover-up of the Murder of DNC Staffer Seth Rich? “I have a source inside the police department that has looked at me straight in the eye and said, ‘Rod, we were told to stand down on this case and I can’t share any information with you.’ Now, that is highly unusual for a murder investigation, especially from a police department. Again, I don’t think it comes from the chief’s office, but I do believe there is a correlation between the mayor’s office and the DNC and that is the information that will come out [Tuesday]”. One would think CNN, and other stations with a liberal bent would want to focus on a possible murder cover-up, or the whereabouts (and contents) of Rich’s computer. 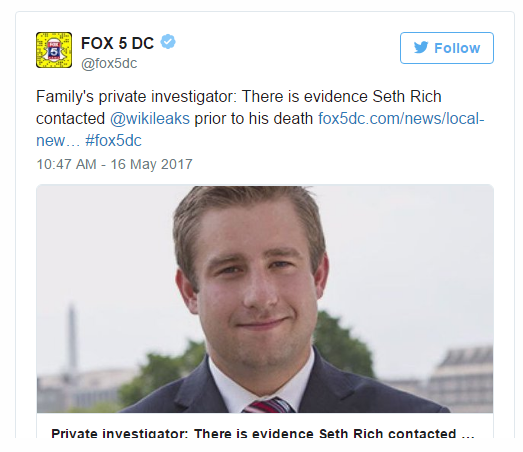 While Fox stated “Rod Wheeler backtracks statements about Seth Rich investigation,” as clarification to the updated link, it failed (thanks to CNN’s intrepid journalism) to explain how clarifying one statement erases the validity of others, or specify that most statements were never backtracked. So, Wheeler states there’s a cover-up. Wheeler states he does not know the whereabouts of Seth Rich’s computer, which he believes holds the truth regarding potential ties to WikiLeaks. Two claims that have nothing to do with a source at the FBI, since other pieces of circumstantial evidence bolster both claims. 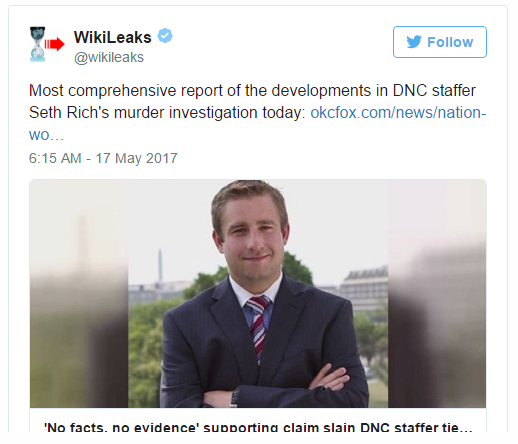 Apparently, CNN’s Oliver Darcy doesn’t care about both clearly stated claims, and made no mention of these claims in his recent hit piece on Wheeler, prompting establishment media to proclaim victory in the Seth Rich murder narrative. Oliver Darcy, a senior media reporter at CNN wrote a piece titled Story on DNC staffer’s murder dominated conservative media — hours later it fell apart. When reading the title, one might think this story is purely about political partisanship, rather than a murder investigation that’s provided no leads after one year. However, it’s almost certain Rod Wheeler doesn’t view himself to be a mouthpiece for conservative media and the Rich family hired him for his expertise. Great, show us the email, Oliver Darcy! The screenshot of the Tweet (in case Darcy pulls a Cenk Uygur), and the Tweet itself speak volumes. First, it’s highly doubtful Rod Wheeler would agree entirely with the headline Story on DNC staffer’s murder dominated conservative media — hours later it fell apart. Darcy’s mystery “Wheeler email” almost certainly doesn’t condone CNN’s misleading headline. If anything, the majority of the Fox interview was about something other than an FBI source. Wheeler clearly spoke about the D.C. Police Department cover-up (and Rich’s laptop) for the majority of his short interview with FOX 5 and it’s telling that FOX and CNN’s Darcy fail to make that distinction. Wheeler instead said he only learned about the possible existence of such evidence through the reporter he spoke to for the FoxNews.com story. He explained that the comments he made to WTTG-TV were intended to simply preview Fox News’ Tuesday story. The WTTG-TV news director did not respond to multiple requests for comment. “I only got that [information] from the reporter at Fox News,” Wheeler told CNN. For a breakthrough article in the Seth Rich saga, Wheeler is hardly quoted at all (short, likely out of context quotes) in the over 800 word CNN piece. Interestingly, nobody knows what [information] Darcy is referring to in one quote of Wheeler, nor does the reader know the actual question Wheeler answered. “I only got that [information] from the reporter at Fox News,” and not simply your summary of the question? In the interview on Fox, Wheeler states he has a source, but doesn’t specify only an FBI source; the maniacal focus of Darcy’s CNN piece. Why would that discussion be automatically shut down by DC Police? Any thoughts, Oliver Darcy? These six Tweets were sent at different times after the latest Fox story, and there are potentially a greater number of WikiLeaks Tweets since last year, after Seth Rich was murdered. Is CNN’s Oliver Darcy claiming that 5 retweets by WikiLeaks and one by Julian Assange have zero relevance to this case? 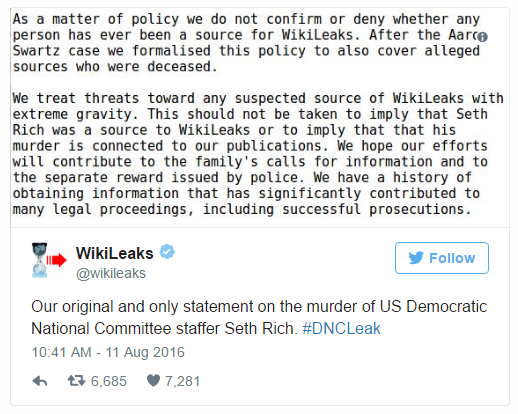 It’s highly doubtful WikiLeaks or Assange would go out of their way to retweet various pieces of information pertaining to the Seth Rich case, if there was no link whatsoever to Seth Rich. In addition, this doesn’t mean Seth Rich was the WikiLeaks source. 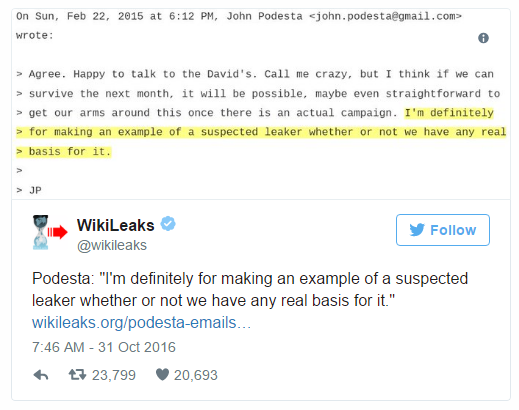 It only means there’s a possible connection (Rich might have been involved, in some way with WikiLeaks) due to the Podesta emails stating Clinton’s campaign chairman was willing to make an example of leakers, or the WikiLeaks reward, etc. 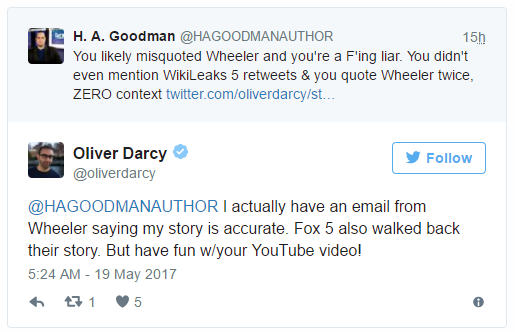 Darcy’s overt disregard for Wheeler’s claim of a cover-up and his statements on the importance of Seth Rich’s laptop also discredits CNN’s obvious hit piece on Wheeler. If your email, Mr. Darcy, shows that Rod Wheeler approves 100% of the title Story on DNC staffer’s murder dominated conservative media — hours later it fell apart, then I’ll offer a sincere apology and retract my claims that you’ve deceived people regarding this topic. Until then, there’s a possible cover-up at the DC Police Department, and a laptop that holds the keys to the Seth Rich murder is nowhere to be found. Even if Wheeler had an IRS or NASA contact as a source, or any other federal employee, those two issues (DC Police cover-up and laptop information) would remain just as relevant, and sadly, just as ignored by people like CNN’s Oliver Darcy. Dianne Feinstein and James Clapper have both stated categorically that no direct evidence of Trump colluding with Russia exists (to their knowledge), yet circumstantial ties have dominated American media. If the same logic is applied to the Seth Rich case, circumstantial evidence points to far more than a failed robbery. Thankfully, more people care about potential police corruption, or the fate of whistleblowers, than CNN and establishment pundits. Finally, millions of progressives, liberals, independents, and people who never vote Republican want justice for Seth Rich. To claim it’s only of interest to right-wing conspiracy theorists isn’t only disingenuous, but ignores a large portion of the United States wondering at this moment if there’s indeed a Seth Rich cover-up.